Week Two of Spanish-Language Literature Month sees me bending the rules a little, but in a good way, I hope. You see while today’s choice hails from Spain, the language is not of the usual variety. We’re heading a little off-road in this post, far from the usual haunts of our Spanish-language literature favourites – let’s a take a short trip to the country (and yes, there will be cows…). 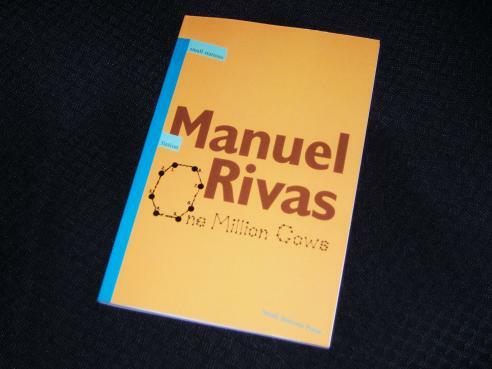 Manuel Rivas is a fairly well-known Spanish writer, but what most may not have realised is that he doesn’t write in Castilian Spanish but in Galician, a language closely related to Portuguese. That’s why Small Stations Press, a new publisher specialising in Galician-language fiction, are the perfect choice to bring out One Million Cows (translated by Jonathan Dunne, review copy courtesy of the publisher), an early collection of the writer’s short stories. The book contains eighteen pieces, running to just under a hundred pages, with some being rather short (the opening piece, ‘First Love’, is just under two pages long! ), but all having a certain something for the reader to ponder. This theme is evident elsewhere in the book. ‘Cotton Fields’ describes a phone call from a woman begging for her soldier son to come home to harvest the fields, one in which she’s unable to produce the social structures necessary to complete the call successfully. ‘Madonna (Christmas Story)’, the last story of the collection, is a short, melancholic tale, hinting at the depopulation of the rural area, the ‘Mad Cow disease’ epidemic hitting the region particularly hard. It’s a sort of homecoming and a powerful piece which somehow creates a whole backstory in just a few pages. There’s a lot to like about A Million Cows, a slender volume, but one that’s very enjoyable. It’s full of clever vignettes, superbly detailed snap-shots of regional life. Often, it’s about the scene, not the story, and Rivas approaches his homeland from several angles, describing both the coastal towns and the farms of the interior. The overwhelming feeling permeating the stories is of a region in decline and a culture slowly being suffocated by the mainstream – it certainly doesn’t feel like an area on the rise. I really enjoyed his last novel to appear in English (All is Silence) and was lucky enough to see him at the Edinburgh Book Festival. Hadn’t heard of this, though, so thanks for drawing attention to it – sometimes very short short stories are just the thing! Grant – Not a writer I’d tried before, but I’d definitely like to have another look at his work. I do remember ‘The Carpenter’s Pencil’ coming out a while back – another one to try perhaps. Bought last weekend Rivas’ From unknown to unknown – poems translated by Jonathan Dunne and also published by him and his wife Tsvetanka Elenkova in their Sofia-based publishing house Small Stations Press. Looking forward to this read particularly after your interesting review. Small Stations Press publishes also contemporary Bulgarian poetry, in which I am quite interested as well. It’s always a pleasure to discover such small publishing houses with a clear focus and good program.